Advisor, Consultant and Teacher on Energy and the Environment. Past Associate Professor of Energy Studies, University of Johannesburg. Visiting Associate Professor in the School of Animal, Plant and Environmental Sciences, University of the Witwatersrand, Johannesburg. 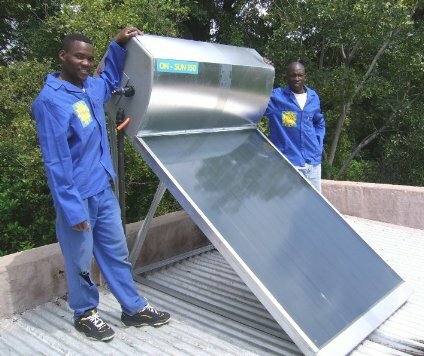 Sole Proprietor, Gauteng Solar Solutions, Agents for On-Sun South African designed and built solar water heaters. Greetings from John Ledger and Gauteng Solar Solutions! 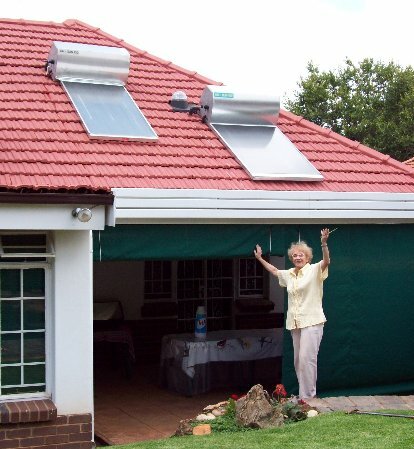 Introducing the On-Sun solar water heater – neat, functional, practical, freeze-resistant, made in South Africa by South Africans, using South African materials and skills. Strong and reliable in sun and snow for TWENTY EIGHT YEARS – since 1990. We market and instal the South African designed, patented and manufactured On-Sun solar water heater in 150 and 300 litre models. Our standard model is the 150 litre system, which can be doubled up to 300 litres by connecting two matching 150 units in series. Standard 150 litre is R13,500. Installation is R4,000 plus materials used. Average installed price is usually around R18,000 depending on the amount of plumbing material used. A 300 litre system involves two 150 units, but the installation charge would be R5,000 rather than R8,000. We recommend and can supply a remote temperature display that tells you how hot the water is in your On-Sun, and this in turn informs you about how to manage your hot water system for the best economy. This display unit can be mounted next to your electricity distribution board, or anywhere else in the house that is convenient for you. The price is R400, plus the cost of the twin ripcord used to connect the sensor in the SWH to the display unit..
We recommend and can supply a South African manufactured CBI electronic timer to control when your hot water system might require boosting to ensure you always have hot water. The timer works in conjunction with the thermostat in your geyser or solar water heater, and helps reduce your electricity consumption for water heating to the minimum. It has a battery backup so keeps time during outages. 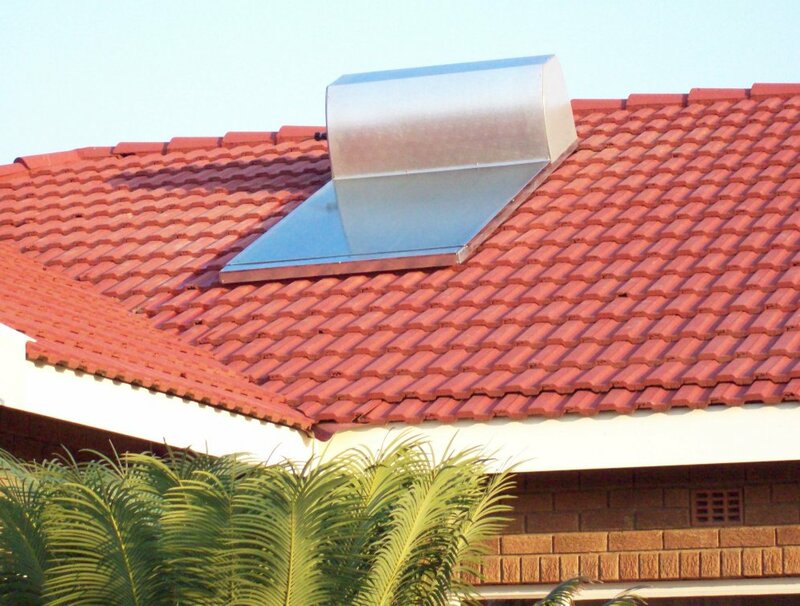 Our On-Sun solar water heater has been built by South Africans for 28 years, since 1990, using local materials and components. It is a practical, strong, reliable, durable, fully repairable and, above all, proven solar water heater for South African conditions. The On-Sun is built in a small factory with excellent quality control. We have full confidence in our product and believe that our track record is your assurance of quality and durability. We also undertake to remove our system and pay you back in full if you are not happy with our product, within three months of the installation. The On-Sun 150 SWH was successfully tested at the SABS for compliance for the Eskom rebate scheme, and passed with flying colours, but we never participated in that programme, and our prices have always been based on a fair, non-subsidized cost for a good, durable, locally made product. We will continue to do business on this basis. The Eskom subsidy scheme has come to an end, and has not been replaced. Many solar water heater suppliers went bankrupt as a result, and numerous installers have lost their jobs. The Eskom rebate scheme was supposed to stimulate demand for solar water heaters, but in the end it only stimulated supply. The result is now history. Thank you for visiting this site. Please browse the information below – I hope you will find it interesting. Please call or e-mail me if you have any queries. I enjoy talking about solar water heating to interested people! Best wishes to all our clients and readers. 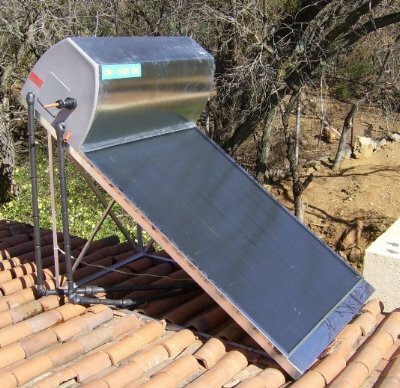 The On-Sun DIRECT solar water heater was first designed and built in 1990, and has now been in service for 28 years! DIRECT means that no heat exchange fluid is involved in this system, making it simpler and more efficient. I have been marketing and installing the On-Sun for fourteen years, and I am happy to offer you my experience and time to consult, discuss and conduct a free site visit to assess your solar water heating requirements, within reasonable distances around Gauteng. When you buy an On-Sun system from us, I will personally be on site with my team to install and commission it. When you buy our South African On-Sun solar water heating system, you own the system and you make the savings in electricity. Every year you save more as the cost of electricity goes up. With an expected lifespan of at least 30 years, and probably longer, this is an excellent long-term investment. If necessary, old systems can be refurbished at a fraction of the new price. Most of our installations involve fitting the On-Sun 150 as a pre-heater in series with your existing electric geyser. Used correctly, this combination should reduce your geyser’s electricity consumption by between 60 – 80%. Please read our item below about the rationale of installing the On-Sun as a pre-heater to your existing geyser. There is no such thing as ‘FREE HOT WATER’! You either have to pay for the solar equipment to harvest the energy from the sun, or you have to pay for the fuel to heat your water, in different proportions, according to the technology you employ. Remember that in life, as in nature there are NO FREE LUNCHES! You can buy a cheap electric geyser and then pay for expensive electricity during the lifetime of the geyser. Or you can buy a relatively expensive solar water heater and pay almost nothing for the solar energy it will employ to make hot water. But when there is no sun, you will always need some kind of back-up for warming your water. You can make warm water by using electricity, gas, wood, coal or solar. Solar provides an elegant solution, and once your equipment is paid for, the recurrent costs of the solar energy are free. We always do a site visit before providing our clients with a written quotation, to make sure that we identify any problems beforehand and that our installation will go smoothly. We promote, market and instal On-Sun South African Solar Water Heaters in Gauteng Province, the vibrant business and economic hub of South Africa. I am a professional energy practitioner, past Associate Professor of Energy Studies at the University of Johannesburg, and current Visiting Associate Professor at the University of the Witwatersrand. I have taught post-graduate courses in energy, notably the BSc Honours programme in Energy Studies at UJ and the Energy and Environment module for the MSc programme in Environmental Science at Wits. FOR YOUR CONVENIENCE WE INCLUDE A LIST OF ON-SUN AGENTS FROM OTHER PARTS OF SOUTHERN AFRICA AT THE END OF THIS SITE. PLEASE FEEL FREE TO CONTACT THEM DIRECTLY IF YOU LIVE CLOSER TO THEIR LOCATIONS THAN TO ME IN GAUTENG. 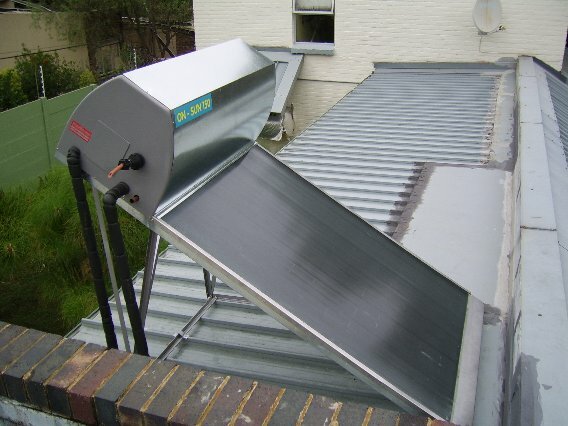 We concentrate on only one product , the remarkable On-Sun solar water heating system, designed by Willi Suremann 28 years ago in 1990 and built by hand in his small factory in Ladybrand, in the Free State province of South Africa. We devote all our efforts to placing these ‘personal power stations’ on as many South African roofs as we can, to harvest the abundant energy of the African sun. The On-Sun South African Solar Water Heater embodies all Willi Suremann’s experience and skills acquired over a lifetime of working with renewable energy. 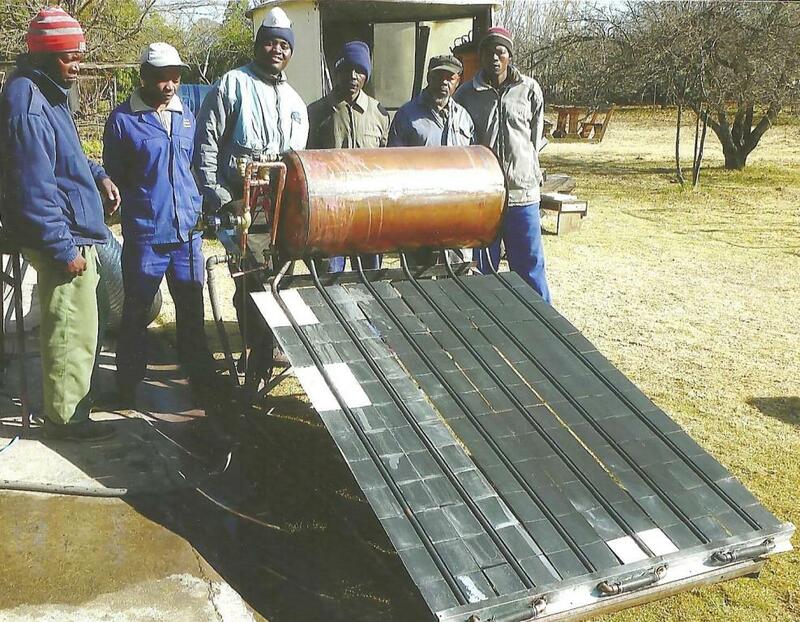 Thirty eight years ago, in 1980, Willi established a business to instal photovoltaic systems and solar water heaters for farmers, schools, clinics, hospitals and mission stations in the Eastern Free State and Lesotho, where the high altitude, intense solar radiation and freezing winters resulted in a very high failure rate of the various water heating products that he bought from other suppliers. The only product that worked consistently well was the Van Leer direct system (no heat transfer fluid), manufactured with special machinery as a stainless steel ‘envelope’ that could withstand freezing by flexing to accommodate the increased volume of ice inside. There are still many Van Leer direct systems working in freezing conditions in South Africa. Below is one that Willi installed in Ladybrand in 1980. In April 2007 he removed the system for refurbishing. Although the old fibreglass covers were almost completely opaque, the system was still working and making hot water. After cleaning the panels and fitting new toughened glass, the 37 year old system was as good as new again! You will hear and read a lot of propaganda from people who only market indirect systems about why direct systems cannot be used in areas that experience frost. The Van Leer collector is a direct system, many of which are still functioning in South Africa after more than 35 years. It is often said that ‘direct systems’ must not be installed in areas that get frost in winter – most direct systems cannot, but the On-Sun is another direct system that has been exposed to frost, ice and snow for 28 years! The Dutch Van Leer company decided to withdraw from South Africa because of the country’s apartheid policies. 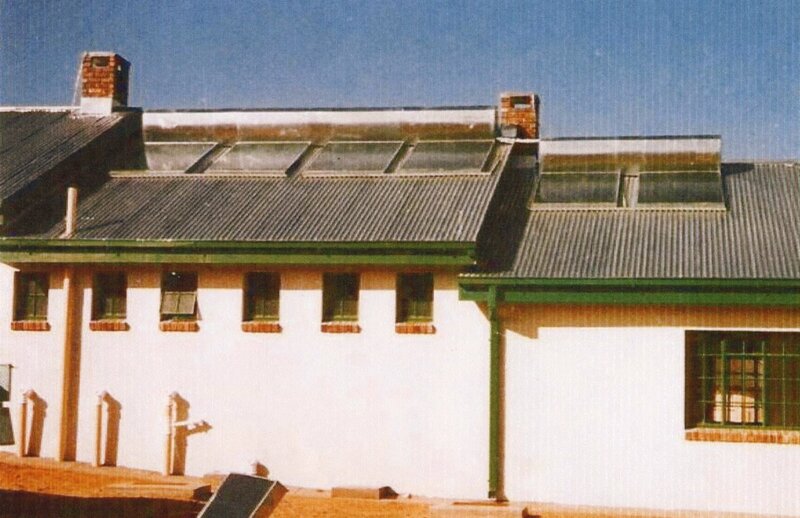 The machines used by Van Leer to make their unique collectors were bought by a competitor who changed the design, resulting in collectors that failed on a massive scale during a particularly cold winter in the mid 1980s that saw temperatures in Johannesburg drop to -7 degrees C. This resulted in a setback to the solar water heating industry that persisted for over 30 years. It is only fairly recently that rising electricity costs and reliable solar water heaters are creating the renaissance in harnessing the power of the sun once again. • the system had to be resistant to both hail and freezing and be simple to instal and maintain. 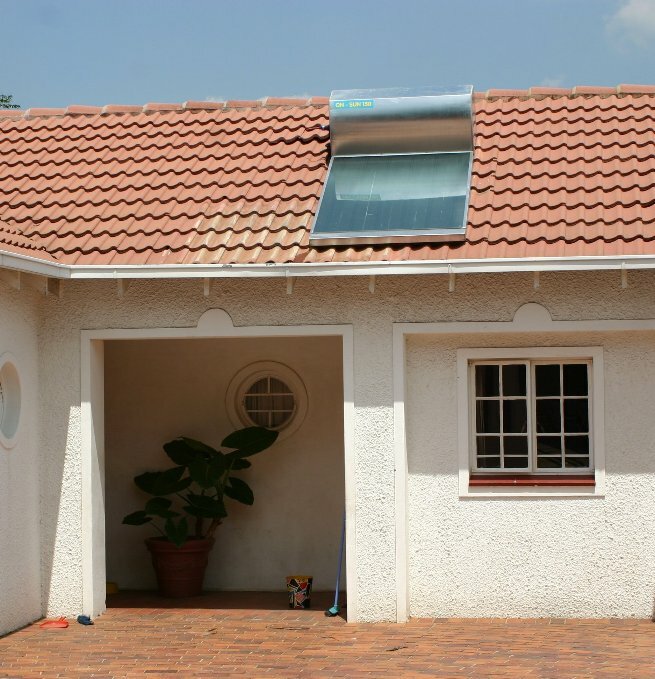 The result: The On-Sun South African Solar Water Heater! Today the On-Sun is the only freeze-tolerant, flat plate, direct system (no anti-freeze, pumps or valves) solar water heater made in South Africa! What are the Advantages of the On-Sun system? • No regular servicing required by On-Sun system – only fix when something fails – and that is very rare! • On-Sun has a track record of 28 years of reliable service in Lesotho and the eastern Free State under extreme climatic conditions – a true test of quality! Here is a system that was installed on the ablution block of the Sehlabathebe Farm Training Centre in Lesotho in April 1992, and that is still going strong 26 years later! Lesotho has one of the harshest climates in Africa. 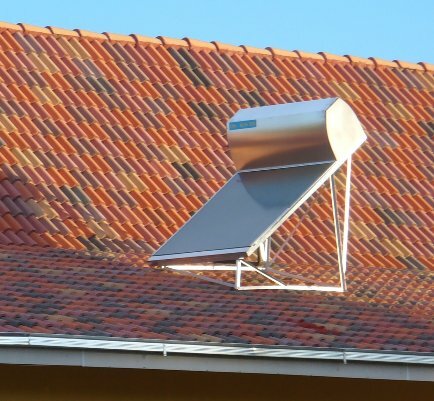 A solar water heater that can work in this climate has to be tough! We design and make steel frames for fitting the On-Sun to any roof. 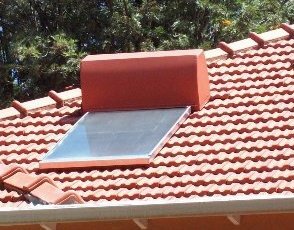 Below is a system installed on the west-sloping roof of a house in Ladybrand. 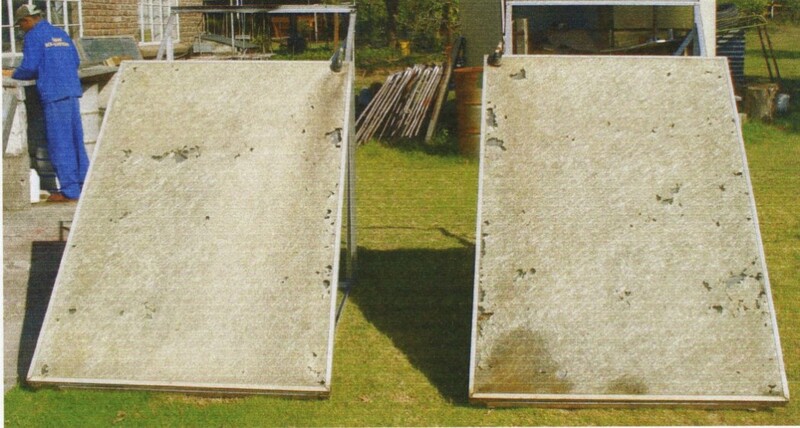 On-Sun complied with all four SABS Tests for the South African National Solar Water Heater Standards required by Eskom. SANS 1307 is the standard for exposure, rain penetration, hail resistance, freeze resistance, marking and the 250 000 pulsation test. SANS 6211 is the standard for thermal performance (Q factor) and heat loss. The Q factor for the On-Sun 150 is 16.412 Megajoules at 16 MJ. SANS 151 is the standard for fixed electric water storage heaters. SANS 60335-2-21 is the standard for the safety of household and similar electrical appliances. Part 2 covers the particular requirements for storage water heaters. If you have an existing electric geyser in good working condition, we recommend that you leave it in place, keep it insured under your household policy, and instal the On-Sun solar water heater in series to supply the geyser with water heated by the sun. Not only will this save you significant amounts of electricity, it also increases the total capacity of your hot water system. In such an installation the heating element of the On-Sun is not connected to the mains. This has the advantage that no new electrical work is required and therefore no new Certificate of Compliance needs to be issued by an electrician, which saves you money on the installation. THESE CALCULATIONS DO NOT ACCOUNT FOR THE STANDING LOSSES OF THE ELECTRIC GEYSER, WHICH MAY BE AROUND 2.6 kWh/24 hours, depending where you live. Once the incoming water is at 55º C or higher, the thermostat will not switch on at all. This is how the On-Sun installed as a pre-heater works. On a sunny day hardly any electricity will be consumed by the geyser because the On-Sun will feed it with water above 60ºC. We always insulate the piping carrying hot water from the solar water heater to the electric geyser with foam rubber sleeves. We recommend that your electric geyser should be fitted with a suitable insulating blanket, and that the hot outlet pipe of the geyser be fitted with a one metre insulating sleeve to reduce thermal loss. If your electric geyser does not already have an insulating cover fitted, we will do this for you at no charge at the time of installation. PLEASE REMEMBER THAT THIS TYPE OF INSTALLATION WILL PERFORM OPTIMALLY IF YOU CONTROL WHEN THE ELECTRIC GEYSER ELEMENT IS ALLOWED TO SWITCH ITSELF ON! We can offer you advice about the supply and installation of a suitable timer to control your geyser automatically. This way you can ‘fine tune’ your hot water system to ensure that the geyser only switches on for a limited time each day to ‘boost’ your hot water in case it has been overcast and there has been insufficient solar energy to get your solar system above 55 degrees. We recommend the South African CBI electronic timer with inbuilt battery backup, which will ensure that your timer keeps time during municipal or Eskom power failures. The On-Sun has a very clean and neat appearance, as all the water controls are contained within the tank cover. The standard tank cover is galvanised steel, which can be painted to match the roof if required. 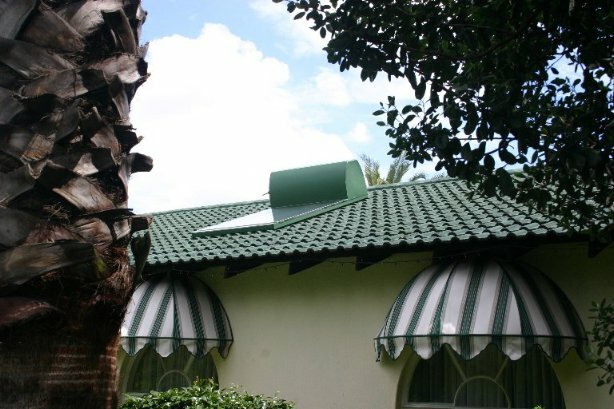 Tank covers can be painted to match the roof colour by the owner, and are also available in stucco aluminium or stainless steel by special arrangement and extra charge. This is a standard 150 litre model, fitted flat on a north-facing pitched roof. This On-Sun 150 litre unit is mounted on a steel frame on a flat roof, to achieve the correct orientation (true north) and tilt (35 degrees from horizontal at a latitude of 25 degrees South). We can make up computer-designed frames for any roof pitch or orientation.The unit can also be mounted on the ground if required, as below. Here we use a matched pair of standard 150 litre units that are closely connected in series. A cover over the connections makes for a very neat appearance, with no piping visible. 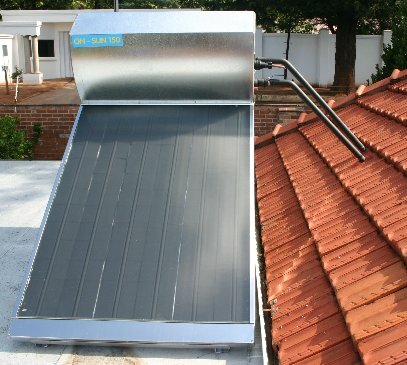 I have been marketing and installing the On-Sun South African Patent Solar Water Heater in Gauteng, South Africa, for 14 years now, and I have learnt to appreciate the very special qualities of this unique product. By the way, I also own four On-Sun 150 units that are in daily use at home and office, so I am a practicing On-Sun user who walks the talk every day! We have installed On-Sun systems in Greylingstad and Nelspruit in Mpumalanga, Ventersdorp, Klerksdorp and Lichtenburg in North West, Pretoria in the north, and Meyerton in the south of Gauteng. We prefer to work in Gauteng, but remember that the On-Sun is easily installed by any plumber or handyman, so you can always pick up a unit from us and DO IT YOURSELF! When a satisfied client orders a second On-Sun because the performance of the first is so good, we really feel proud of our product! Mrs Kirsch installed an On-Sun 150 litre system for her kitchen, scullery and outbuilding. It worked so well that she ordered a second one for her bathroom. We installed an On-Sun 150 202 split system close to the first. 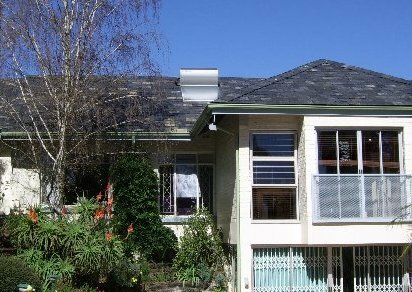 This house is now harvesting a significant amount of thermal energy from the sun, and cutting electricity costs! We installed three systems for a client in Houghton, Johannesburg. One standard 150 litre On-Sun was mounted on a frame on a horizontal concrete roof (left) as a stand-alone supply with electric backup to a flat (we removed the existing geyser). A 150 litre 202 split system (right) was installed on the main house as a pre-feed to the electric geyser. A 100 litre system was fitted onto the roof of a patio next to the swimming pool, to supply hot water to an outdoor shower and a hand basin. The tank covers of the latter two systems were painted by the client’s handyman to match the terracotta colour of the tiled roofs. He did a really great job! Two On-Sun 150 units were installed, one on the main house and the other on the outbuilding. The main house system was mounted flat onto the slate roof, while the system for the outbuilding was mounted on a steel frame to get the best inclination for year-round performance. On-Sun 150 system installed on a steel frame on a back-sloping IBR roof with loose tiles on top. This On-Sun 150 has been painted to match the green tiled roof of the house. Water-based primer and roof paint from Prominent Paints was applied, after the tank cover and tray were thoroughly cleaned with galvanized steel cleaner and the fibreglass end-caps sanded with water paper. The paint is guaranteed for seven years and the On-Sun can be touched up whenever the roof is repainted. The green solar water heater blends well with the roof, the awnings and the greenery of the garden. Because all the water controls, including the vacuum breakers, are housed inside the tank cover, we do not have unsightly pipes projecting above the system. 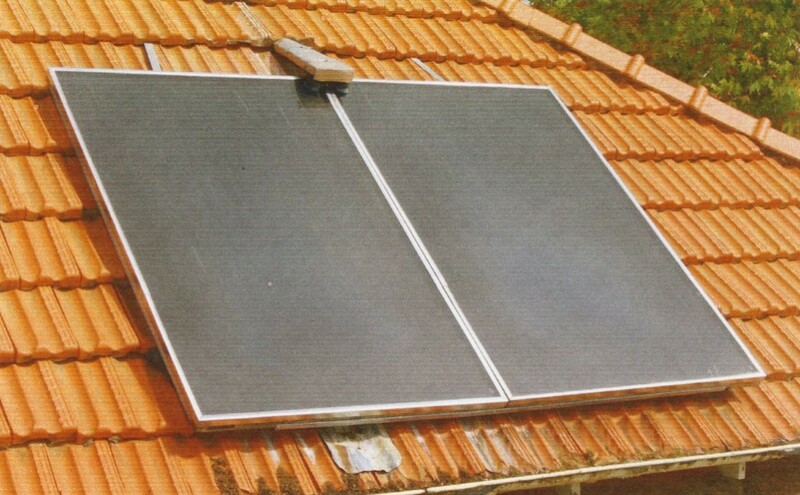 The On-Sun is the only flat-plate, freeze-resistant, direct solar water heater, without special pumps or valves, on the South African market. The SABS test for freeze tolerance requires the system to be cooled to minus 20 degrees C and held there for 14 hours. With its 28 year pedigree in the snow and ice of Lesotho, the On-Sun had no problem with that particular challenge! Remember, if you are not satisfied with your On-Sun solar water heater, let us know within three months and we will remove the system, make good any structural impacts made by the installation, and refund your money in full. No arguments, no lawyers, no harsh words. That is just the way we want to do business with you! The On-Sun factory is in Ladybrand, Free State. 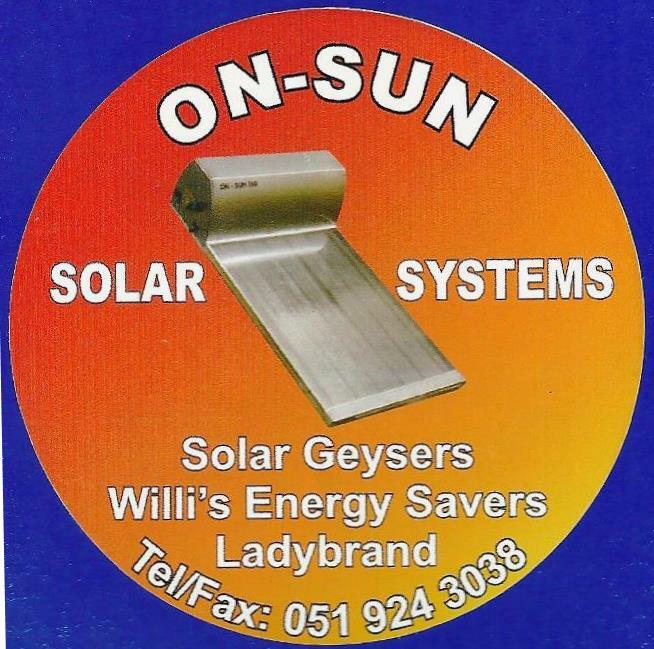 If you have any questions for the most experienced solar water heater expert in Southern Africa, you can call Willi Suremann at 051-924-3038. 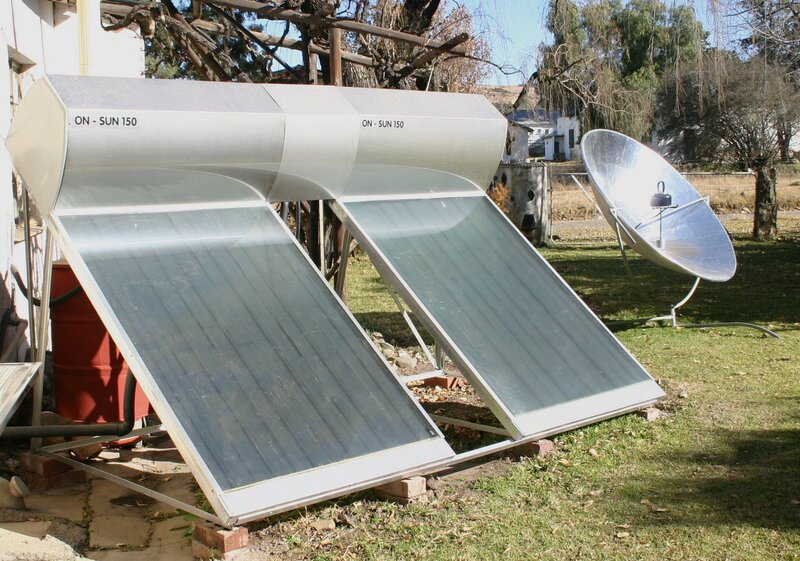 He designed and patented the On-Sun 28 years ago, and thousands of these wonderful solar water heaters are operating effectively and reliably through sun and snow all around Southern Africa. This is a very special product in this age of plastic and mass production, built by hand with craftsmanship and care, using copper, one of the most useful and durable metals known to humankind. This entry was posted in Uncategorized on 2017/01/01 by john4150.